Taapsee Pannu and Bhumi Pednekar are among the most successful and critically acclaimed actresses in Bollywood. With a number of hit films and incredible talent, the two actresses are coming together for the first time on the big screen. The project titled Saand Ki Aankh is directed by Tushar Hiranandani. The first look poster of the film dropped today and the wrinkles on the faces have got our attention. Dressed in traditional UP attire and revolver in their hands, the gorgeous divas are giving away killer vibes! Saand Ki Aankh: Taapsee Pannu and Bhumi Pednekar Go De- Glam and Share Their Desi Avatar- See Pic. As for the plot of Saand Ki Aankh, nothing much has been revealed so far. 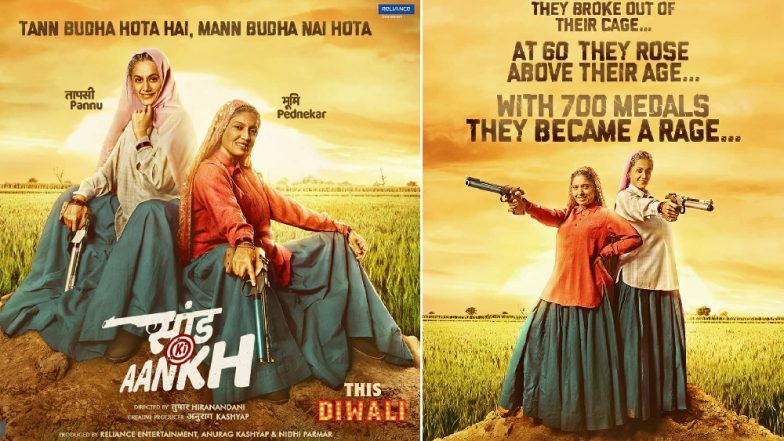 From what has been revealed, it can be predicted that the movie is based on UP-based octogenarian sharpshooters Chandro and Prakashi Tomar. The movie has also been shot in Uttar Pradesh. Both the actresses have earlier shared the real-life and reel-life Chandro and Prakashi Tomar. Helmed by Tushar Hiranandani and bankrolled by Reliance Entertainment, Anurag Kashyap and Nidhi Parmar, the movie is slated to hit the theatres this Diwali.